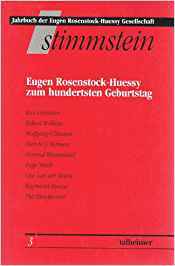 Volume 2, 1988 (ISBN 3-87067-338-9) contains Rosenstock-Huessy’s original handbook on work-service camps (1933), an essay by Wolfgang Ullmann on “New Thinking,” and stories from the Eugen Rosenstock-Huessy-Huis. Volume 3, 1990 (ISBN 3-89376-010-5) contains the papers given at a conference held in 1988 in Würzburg in honor of Rosenstock-Huessy’s 100th birthday. Volume 5 is planned for 1997. The subject is new models for universities. Stimmstein Supplement 1992 contains Rosenstock-Huessy’s essay “Hitler and Israel” in English, German, Dutch, and Polish. Stimmstein Supplement 1995 contains William James’ essay “The Moral Equivalent of War” in English, German, Serbo-Croatian, and Russian. It also has Rosenstock-Huessy’s essay “The Soul of William James” (“Die Seele von William James”) from I Am an Impure Thinker, as well as “The Threat to History and the Danger of Barbarism” (“Die Geschichtsnot und die Gefahr der Barbarei”) from 1932. The Mitteilungsblätter contain smaller works of Rosenstock-Huessy’s. They also contain news items about the Gesellschaft’s activities and projects the Gesellschaft feels carry on Rosenstock-Huessy’s work. There is a section with reviews of scholarly and lay publications. The Mitteilungsblätter appear once or twice a year. They can be obtained by contacting the Gesellschaft’s business office.